The Mediterranean lifestyle is one of the finestâgood weather, ocean breezes and delicious meals shared with family and friends in a picturesque setting. 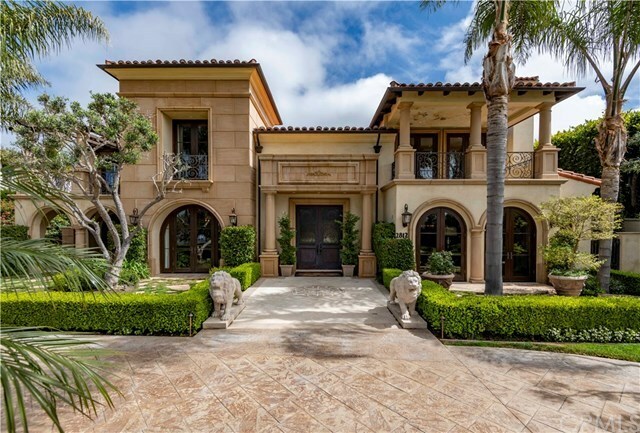 Embrace this style in an expansive Mediterranean style villa near the bluffs in Lunada Bay. The impressive 7100+ square foot home, designed by architect Tony Ashai, welcomes you with a dramatic sweeping double staircase entry and formal living room and office with Venetian plaster walls and coffered ceilings. The formal dining room is an opulent setting for a feast prepared in the spectacular kitchen with marble island and pedant lighting illuminating top of the line appliances. The cozy adjoining family room encourages togetherness and its French doors beckon you out to the entertainerâs backyard. Fireplaces warm and a sparkling pool refreshes. After a few laps, enjoy a workout in your private gym. Movie night takes on a whole new meaning when you can share it with 10 friends in your own home theater. Close the day with your family tucked into 6 ensuite bedrooms, and enjoy a relaxing evening in your decadent master suite with a large sitting area and one of the homeâs ocean view balconies. A steam shower, spa bathtub and private sauna complete the luxurious master bath. Enjoy the Mediterranean life to the fullest right here at home.